The Battle of Algiers is considered a modern classic; it’s depiction of the revolutionary struggle, the FLN liberation fight against French colonialism, raises themes of terrorism, anti-imperialist struggle and guerrilla warfare. The film will be initiated by a short introduction and followed by comment and analysis. As part of the 'On This Day' series, Finn Meehan writes a controversial article on what he sees as the strategic folly of the 1916 Easter Rising. Chris Bambery assesses whether there is any validity to the common accusation that Marxism is deterministic. Did Thatcher’s economics save the country? Adam Frew uses empirical data to dispel the myth that Thatcher saved the British economy. In a polemic against the liberal commentariat and the sycophantic Thatcherites, Chris Walsh defends the Thatcher death parties and critiques the confused moral code which drives the media outrage. The time is now to force the issue over Trident, argues David Jamieson. Nicola Sturgeon, Deputy First Minister of Scotland, makes the case against the renewal of Trident nuclear weapons. Let Scotland lead the way to a nuclear free world! 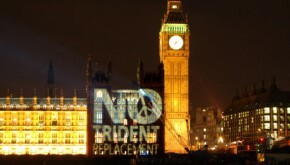 Join us for three days of protest and action against Trident. Paul Gordon looks at the economics of Thatcherism and the inspiration that George Osborne has taken from Thatcher's first Chancellor, Geoffrey Howe.